Having shared a Pint or two with my old mate Dave Tooley last night we got to recalling old memories of the glory days we had in the late 60's and early 70's. So I decided to put it up on the net, so with the help of Daves memory and editing skills here it is. 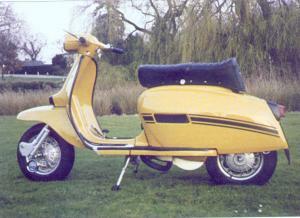 I met Dave at the Solent City Scooter Club, I had just taken delivery of my pride and joy a GP225 supplied by Rafferty Newman ROU 70G was the registration it was Yellow Ochre and fabulous. 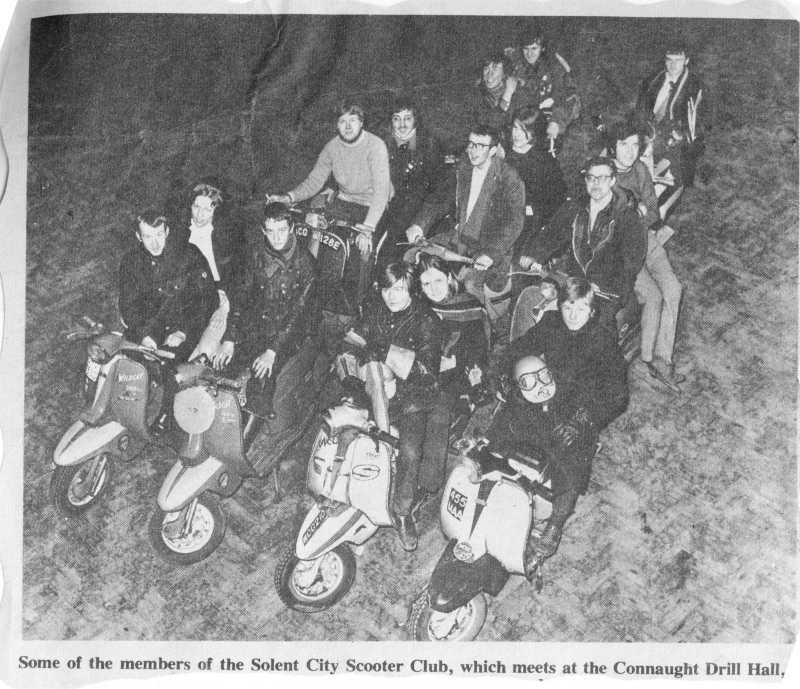 I turned up with my friend Keith Corben who drove a motor bike, he really caused a stir as we swept into the Connaught Drill Hall in Gosport, we were quickly made to feel at home and I joined the club there and then. Dave was riding an old Lambretta LD built by his Dad, a man who loved building Cars and Bikes. I spent many hours round Daves garage helping out building his bikes. 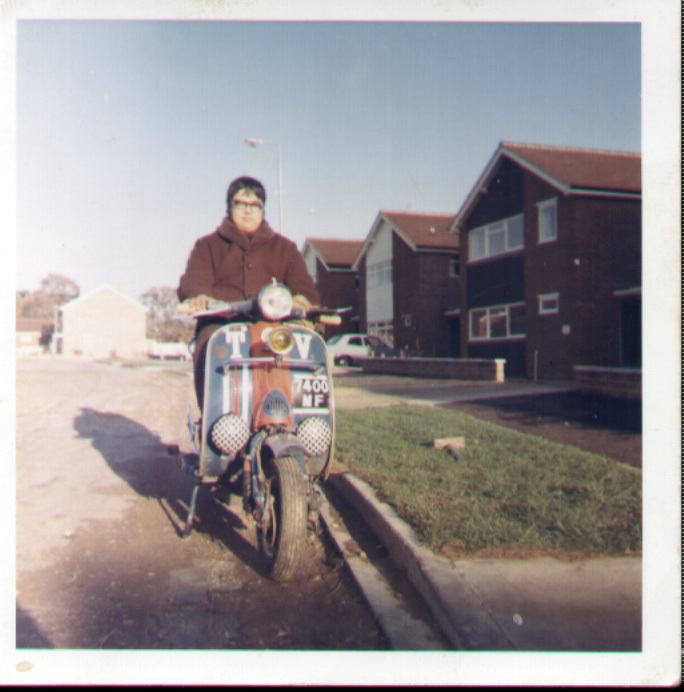 As Dave lived in Fareham we went back with him, on the way his Burgess silencer fell off so we spent a while fixing it back on, That LD was a lovely old machine I bet Dave wishes he still had it. The Connaught Drill Hall was a great place to hold the Club Meetings, as we could drive our bikes inside the building and keep nice and dry. escorting the Mayors car through Gosport. Some of the Best times were Going to the Rallies, always eventful journeys particularly the trip to the Comacs Rally in Romford. Another disaster for me personally was the Isle of Wight Rally, we were doing the marshalling for the rally Terry Langridge and I had to drive out to the needles and sit by the side of the road to give directions to the drivers as they toured the Island. When the last one had gone we headed home this transcript is taken from Dave Tooleys exellent Scooter site as to what happened next. My recollections of the 1970 Isle of Wight Rally as a social event was of a complete disaster. But that is only from my own personal viewpoint. I'm sure many other more socially adapt people had a great time. Mine started on the Thursday night, when young Miss A.T. (name hidden to protect the innocent, but all club members will know who I mean) arrived at my house in her mothers car. We were leaving together very early Good Friday morning to catch the ferry over to the Island, so the plan was for her to sleep on my settee with our alarms set for about 4.30am. Her mother insisted on coming in to investigate the legitimacy of the overnight accomodation. Fair enough, I suppose. I have a daughter, know where she's coming from. But it was still very embarrassing for both of us standing there in the hallway being lectured to by our parents. When you're 17, you feel old enough to make you're own decisions about where you go, and what you do. Needless to say we both overslept, and it was a mad panic to slam everything together on my Scooter and get ourselves down to Portsmouth Ferryport. When we arrived there, the place was absolutely heaving with Scooters of every shape and size. I was not expecting such a huge turnout for the early ferry, and neither was the Ferry Company I think. Absolute chaos reigned for a while, as hundreds of bikes fought to be the first on the boat. The ferry staff wanted to get all the cars on first, then filter the bikes in between, but we had other ideas. When we first arrived at the site we were staying at near Sandown, our lack of pre-planning started to become obvious. We had convinced our parents that our sleeping arrangements had all been sorted, and there was stacks of room in peoples tents to kip down for the weekends. In fact, nothing could have been further from the truth. Some of the more astute and experienced rallyers had forked out for chalets, complete with showers, kitchens, proper beds etc. Us of the more poverty stricken kind had to go around begging for a corner in ANYONE'S tent. What can I say...it rained almost non stop all weekend, and it was cold...very cold, unseasonably cold for Easter time. After just one night of shivering together wrapped up in motley collection of borrowed blankets, we thought this was a really stupid idea and pleaded with the more sensible 'roof over their head' chalet dwellers to give us a few square feet of floorspace. Unfortunately everyone had the same idea, and the chalets on the site became overloaded with chilled campers. The consequence of this was disastrous, since first thing in the morning all the sites ovens were put on to cook 1000 breakfasts and generally heat the chalets up. Plus EVERYONE tried to have a shower at once, resulting in the fuses for the entire campsite blowing. Hence, nobody had any power at all for hours. 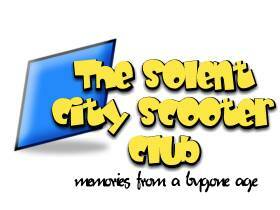 Some of us Solent City Scooter Club members had volunteered ourselves as marshals for the Round The Island Rally event. Thus, whilst many of the less sport orientated individuals cleared off for the day to generally just enjoy themselves in the local bars, a small band of us die hard volunteers sallied off to spend the day getting cold and wet once again. It was during the short trip from one marshaling point to another that disaster struck our little band of brothers. My friend Marten had been having problems with the exhaust system on his bike, and as a temporary fix had wired it up together, with the intention of a more permanent repair when he had the time. 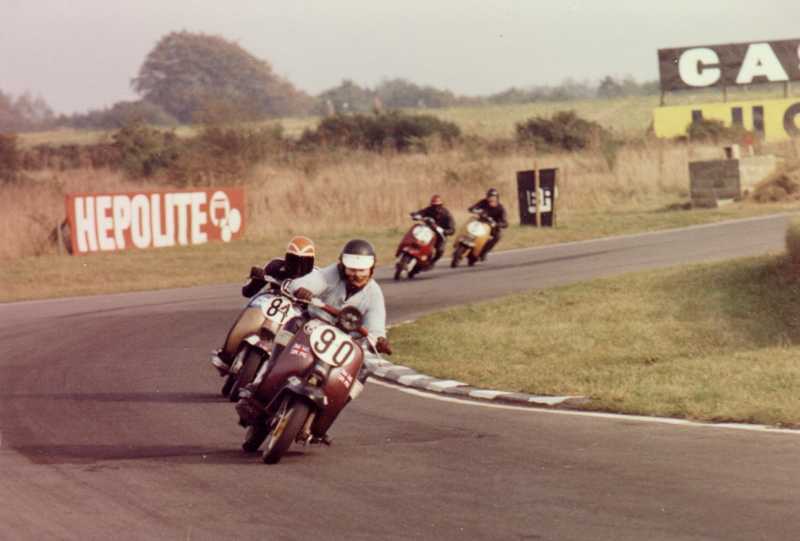 Unfortunately he never got very far with this bodge, and just as him and his pillion passenger Terry came past me on a long downhill straight, the wire let go. I watched in horror as in apparent slow motion the entire exhaust system dropped under his rear wheel, launching them both into the air. The bike tumbled over and over in a shower of sparks, and both rider and passenger tumbled along the deck in a spectacular 70mph slide. I had absolutely nowhere to go, and with both wheels on my bike locked up solid juddered over the legs of Terry who was by now laying prone in the road. I thought I'd killed him…I'd never been so frightened in my life. As it turned out, Terry wasn't too badly hurt, much to my surprise. Just a large collection of bumps and bruises, whereas Marten had a horrendous gash in one of his legs. I could actually see the white of his bones through the severed flesh. Nasty!!! With his bike smashed, and his leg badly damaged, this well and truly put paid to Martens Easter bank holiday. I was left in a state of shock for some considerable time afterwards, and needed several large drinks to bring myself back to some semblance of normality. I remember that night well. After Marten was scraped off the road and taken by ambulance to hospital, much to everyone's surprise they released him after just sewing him up and filling him with pain killers. Someone volunteered a bed for him, and he was dispatched to that for the evening in a very groggy condition whilst we all went out celebrating Easter. When we got back a few hours later the analgesics had worn off, leaving him in agony. Nobody slept that night! All we could here was Marten moaning and groaning. Not without good reason I hasten to add, but it still didn't contribute to peoples good humour the following morning. If I remember rightly Terry wasn't half as miserable as the rest of us, since he'd been consoled for most of the night by young Miss A.T. Think we'll draw a veil over that. All I know is I was dead jealous and not a little miffed that I'd carted her over there, only for him to reap the benefits-if you get my drift. The next day was Sand Racing on Sandown Beach. The worst part was getting the bikes down to the ruddy shoreline. The only way of getting the scooters on to the sand was for them to quite literally be trundled down a series of gang planks at an acute angle over a pile of rocks. The more loopy riders such as Pete Hockley and Nev Frost took to actually half riding, half sliding their bikes down the not very wide and now very slippery pieces of wood. I couldn't watch!!! The consequences of miscalculating the hazardous journey down them wasn't worth thinking about. Rocks don't take prisoners. A very pleasant day was spent watching the riders trying to beat the rising tide. I had a go at racing on the sand as well, but soon decided that using my bike as a racer and my only means of transport around the Island and home was a silly idea, and soon gave up with it before my bike gave up on me. Monday was the hill climb, set up on a local very steep incline with a series of long sweeping bends to catch out the unwary. Suffice to say it rained…a lot…and the mist came sweeping in, making for a very unpleasant morning. Most of us who marshaled wanted to get the darn thing over with A.S.A.P. so we could get packed up and make our way home for a nice hot meal, get out of our sodden clothes, and enjoy a good nights sleep. I seem to remember being very impressed with Ron Moss on his Supertune 200 not giving a damn about the wayward rabbit that decided to roam across the track halfway through his run, nearly ending in disaster. So ended the first Isle of Wight Rally 1970. 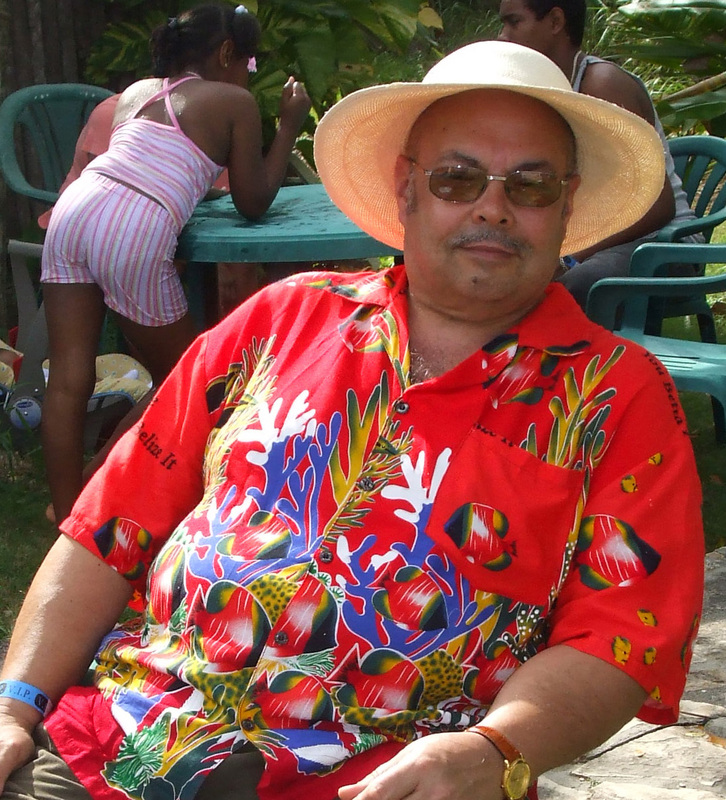 As an event it was very successful for the L.C.G.B. and led to very many more over the following years, but I'll always remember the first. 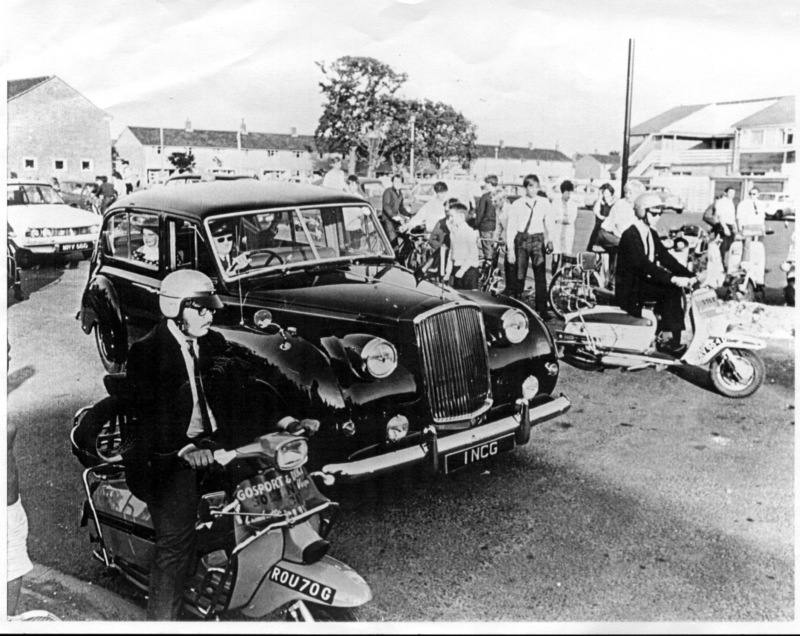 The remains of my GP were taken back to Rafferrty Newmans for rebuilding, may I thank Jackie White (Rex White's Suzuki MD's wife) who bravely took me back to the mainland on the back of her Lambretta, as I couldn't bend my left leg, I had to have it straight out propped on her lap.